When chatting with fellow Master Gardeners and local nurserymen, the kind of gardeners who have advanced degrees in Horticulture or landscape architecture and have been in the business for 40 years, the question was raised: What should you do in the dog-days of summer garden? The answer was a resounding and unanimous NOTHING! It is not recommended that any root disturbing activities take place now but more that of the attentive parenting needed in caring for a frail child. In the middle of winter we learned that indoor plants reach a similar peak-season crisis point simply opposite in terms of light and temperature. Those same nurserymen said that the lack of light and too much watering during cold weather months would over-stress plants struggling for window sill survival and that care takers needed to use some TLC to get them over the hump. The same is true in summertime. Growth has slows down considerably in extreme heat and plants are finished flowering-we just need to get them over the hurdles of harsh conditions and into slightly cooler temperatures. With that in mind, there are five things that we absolutely must NOT do for the next several weeks. NEVER, EVER water at night! This includes trees, shrubs, lawns-any and all plant materials. Water only in the early morning to give plants the rest of the day to dry off. Plants that receive water at night, especially on a regular basis are vulnerable to funguses and molds; these afflictions make them weaker and actually attract invading insects. Plants that are not healthy are like magnets for trouble-especially insects and other pests. DO NOT FERTILIZE right now as it causes plants to make more roots, causing them to become thirstier and diverting energy away from the top. You may use a liquid fertilizer like Miracle Grow or pellets such as Ortho on vegetables or annuals that are flowering. Some composters have a catch basin for compost tea-pour this around the base of the plant. You can make your own tea by mixing composted material from you bin with water in a 2 gallon work bucket. There are many recipes for specific compost teas on the internet. DO NOT SEED the lawn or plant anymore vegetable seeds. Sunlight is too intense right now and can burn or dry out seeds. Transplanting of annuals is also on the no-no list as it would take too much watering-most probably twice a day to keep plants alive and healthy. 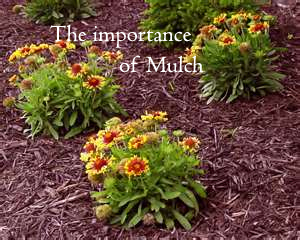 MULCH to protect plants by keeping moisture in, but do not use more than 3”. Too much mulch may encourage roots to turn upwards, seeking moisture. Roots need to be trained to go deeper and become wider with less frequent but deep watering. Over-mulching is especially a problem around trees which are fond of sending secondary roots close to the surface if they detect a great deal of humus and shade. DO NOT PLANT trees, shrubs or perennials right now. Wait until fall when the days are still warm, the soil is still warm, but the nighttime temperatures have cooled off, giving plants a bit of rest from harsh summer conditions. If you have already purchased plant materials that are either in balls, bags, pots or clumps-place them in the shade and keep them well hydrated as containers dry out very quickly in the intense heat. You can even place a handful of mulch on top to help keep moisture in and weeds out. Wait until the end of September through October-as long as it is before the first frost. Heat Wave Watering reminder: Check with your local municipality about watering restrictions. Most towns allow hand watering of newly planted lawns, gardens trees and shrubs as they are an important asset to property values. Initially towns may put residents on an alternate day watering schedule in advance of more stringent rules. Watering in the early morning is even more important as plants will have more time in cooler temperatures to utilize the moisture. If you have a new garden, or are growing tender vegetables, you must watch for signs of wilting. Water immediately! Hopefully, it will not get to that point and the heat-wave will break.